BOOK OF HOURS. - Miniature of Suffrages to the Saints. Miniature of Suffrages to the Saints. - BOOK OF HOURS. 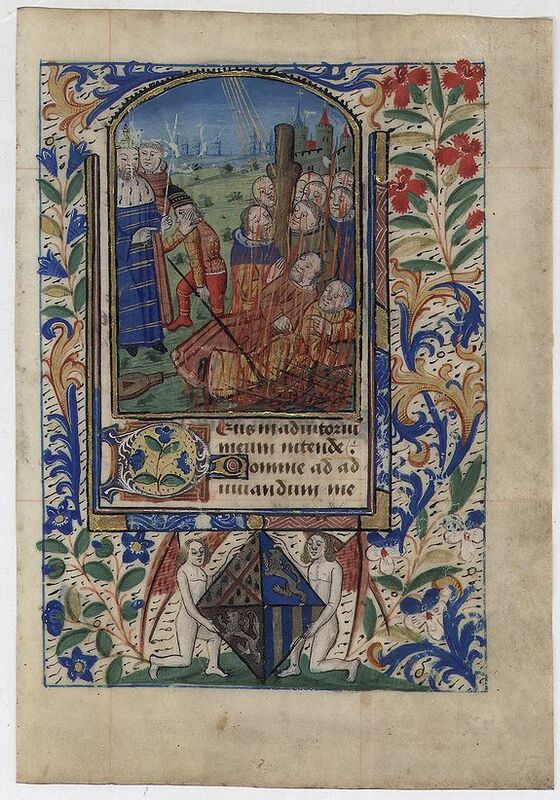 Title : Miniature of Suffrages to the Saints.. Date : France, Bretagne or Normandy, c. 1480. Size : 4.9 x 3.5 inches. / 12.5 x 9.0 cm. Description :A fantastic miniature (70 x 50 mm.) in an arched compartment showing the Suffrages to the Saints. Depiction of the (50) martyrs being burnt before King''s orders. The style of the miniature is similar to the one of the Book of Hours ordered by of Epinay family painted in Brittany or Normandy in the second quarter of the XV century, Rennes ms. 33 (anc.24) 15941. Under the miniature are four lines of text in a Bastarda script and a large 4-lines illuminated initial "D" in blue and white showing a flower with liquid gold ink background. Ruled in red. Borders consisting of leafy acanthus leaves and branches of multiple floral blooms on liquid gold basic field surround all. Interestingly the lower border is filled two angels holding a coat of arms, likely the coats of arms of the person who ordered the Book of Hours. VERSO: thirteen lines of Bastarda script, ruled in red, with four 1-line initials in liquid gold on a rectangular ground of blue coloured ink. Condition : Miniature (7x(cm) painted in lapis lazuli, vermilion, gold leaf, plant-based greens, and ochre, flake white leaf on vellum. Good condition, only slightly age-toned.